As the season eases into milder temperatures at the onset of spring, all manner of creatures stretch their bodies and move more freely, searching for food and mates while they patrol their home turfs. 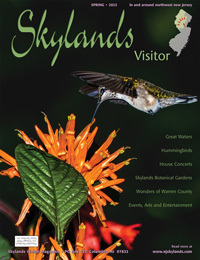 Among these creatures are some of the most rare, interesting, and beautiful animals in the Garden State. Though they often go unnoticed or are misunderstood, reptiles and amphibians are vital to the balance of our fragile ecosystems—and some of them are in pretty big trouble. Reptiles and amphibians, also known as “herps”, have been around since the time of the dinosaurs. Though some modern day organisms look nothing like their ancestors, some, like crocodiles and many turtles, have not changed much since the Mesozoic Era. Other species have come and gone as reptile and amphibians have evolved, but the current wave of global extinctions has researchers concerned. Iconic animals like the Panamanian golden frog and the Pinta Island Galapagos tortoise represent only a fraction of the species lost in recent years. With almost one quarter of reptile species and over one third of amphibian species threatened with extinction globally, we are seeing the equivalent of tens of thousands of years’ worth of extinctions in just this past century. Human activities are mainly to blame for habitat loss and degradation, the rapid spread of deadly diseases, and exploitation in the pet trade, food industry, and black market. These threats, added to a changing landscape caused by global climate change, do not leave a very hopeful future for many sensitive and specialized critters. Our ecosystems need herps! They are integral to the food web, cycling nutrients between habitats, acting as both predator and prey. They help to control populations of ticks, mosquitos, mice, and other creatures that could easily become pests. They feed owls and foxes, and most other forest-dwellers at almost every stage of life. On top of these important functions, amphibians especially alert us to the health of their ecosystems. Being ectothermic (the more technical term for “cold-blooded”) and having skin that is permeable to the exchange of air, water, and even some nutrients, places amphibians in a unique position to “feel” the effects of a degrading habitat from pollution, vegetation changes, and altered temperature and hydrology. Here in northwest New Jersey, there are numerous at-risk reptile and amphibian species, but also many opportunities to conserve them. Even those creatures most feared by society deserve an opportunity to live out their days in peace. Venomous snakes often get a bad reputation as killers despite their preference for seclusion from humans. Truth be told, timber rattlesnakes and northern copperheads, New Jersey’s only venomous snake species, don’t want to waste precious venom on something they can’t eat. They generally strike out at people only when they feel threatened, usually when people harass them out of fear or hatred. 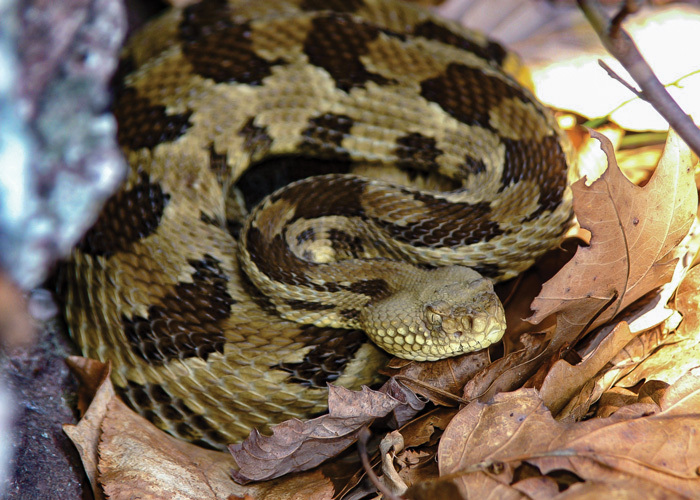 Killing even one adult timber rattlesnake, now a state endangered species, has drastic consequences for the population. This snake has relatively few offspring per litter, and might only reproduce once every three or four years. And timbers don’t reach maturity until they are about nine or ten years old, which means when they left alone to reach a ripe old age of about twenty-five years, they can continue to contribute to future generations. As word has spread about the importance of reptiles, the public has warmed up to these “cold-blooded” creatures. 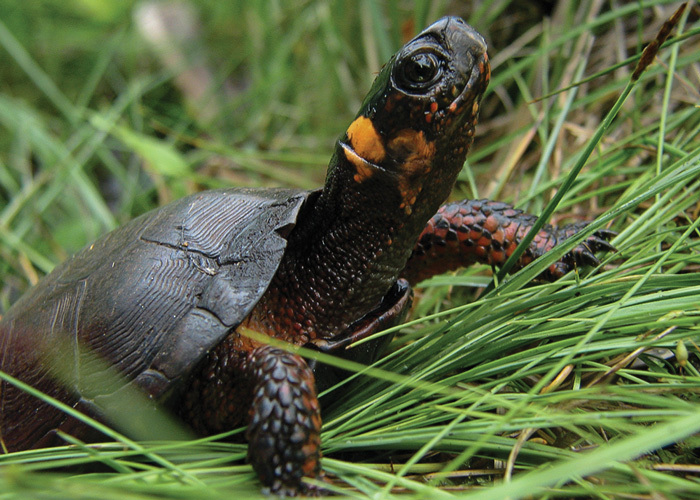 Just last year, New Jersey declared the federally threatened and state endangered bog turtle the official state reptile, sparking renewed desire to protect North America’s smallest turtle. That’s a good thing, since about half of the remaining bog turtle habitat in the state is held by private landowners. State and federal agencies, and non-profit partners, work with many of these landowners to protect the unique bogs and fens these turtles call home. 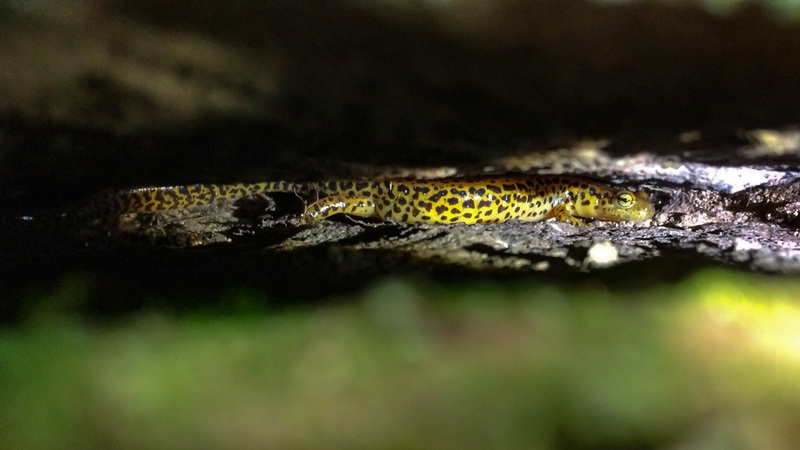 A wide variety of secretive salamanders crawl through leaf litter, streams, and seasonal pools, making up a surprisingly high proportion of the vertebrate biomass of our deciduous forests. There are more salamander species in North America than anywhere else in the world. Besides the most common, like the redback salamander and red-spotted newt, there are also those species that are struggling to persist in the state. 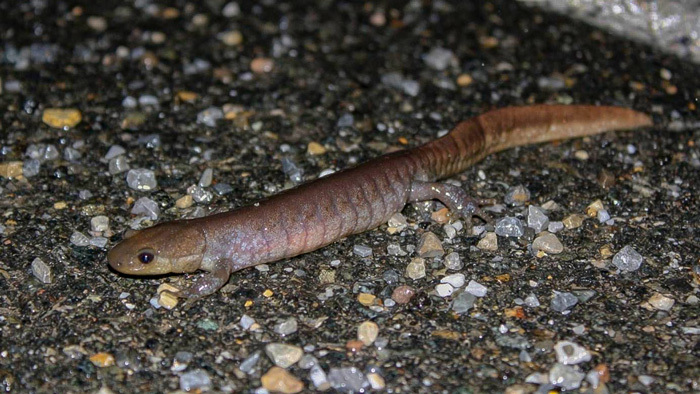 Longtail salamanders are restricted to limestone areas primarily in Sussex, Warren, and Hunterdon counties. This state-threatened species belongs to the lungless salamander group (Plethodontidae) and, as its name suggests, has an unusually long tail that aids in swimming through waters of slow-flowing streams, fens, and swamps. Although it is difficult to study these vibrant creatures that spend most of their time hidden in rock crevices and underground seeps, we do know that unchecked development is the cause of the reduced forest cover, increased erosion, and poor water quality that threatens their survival. But ongoing research is providing more information to better protect this species, while policies regarding wetland regulations and development permitting reviews afford necessary protections for remaining longtail populations. Other salamanders are more visible during the springtime breeding season, for better or worse. They make spectacular migrations during warm, rainy, early spring nights from their hibernation spots within forests to their breeding sites at vernal pools—small, seasonal ponds that fill with rain, snowmelt, and groundwater in the spring and dry by summer. These sensitive pools are vital for many amphibians as they provide a haven for their young safe from predatory fish. Some species breed only in these types of pools, and many faithfully return to the exact same vernal pool each year. A major problem arises when these amphibian transportation corridors intersect with those of humans. Our dense network of roads fragments the landscape, and many amphibians find themselves dodging traffic to reach their breeding destinations. That is the case for the declining spotted salamander and state-listed Special Concern Jefferson salamander in Sussex and Warren counties, where the Conserve Wildlife Foundation of New Jersey (CWF) hosts its Amphibian Crossing Project. Volunteers come out to help CWF and New Jersey Division of Fish and Wildlife Endangered and Nongame Species Program (ENSP) staff to ferry salamanders and frogs across busy roadways, ensuring the survival of as many individuals as possible. Volunteers keep track of the numbers and species moving across these roads, with the end-goal of implementing wildlife passage systems in these locations, including under-road tunnels and guide fencing. Such wildlife passage systems will help reconnect fragmented habitats and reduce mortality caused by human-wildlife conflicts. The Amphibian Crossing Project is part of a larger campaign that ENSP is bringing to the forefront of conservation efforts within the state. Connecting Habitat Across New Jersey, or CHANJ, is an initiative to make New Jersey’s landscape more permeable to wildlife movement. As critters travel in search of mates, food, and shelter, they encounter the effects of steady urbanization that breaks up their habitats and makes long-term persistence more difficult for populations. To be more proactive and collaborative in addressing habitat connectivity concerns, CHANJ provides mapping and strategic guidance resources for land-use, conservation, and transportation planners. In this way, CHANJ helps preserve core wildlife habitats, restore links between these important habitats, and make roads safer for wildlife to cross. CHANJ is already in effect throughout the state. Bedminster Township in Somerset County hosts one of a few already existing wildlife passage systems in New Jersey. Tunnels under River Road are designed specifically to guide the state-threatened wood turtle across the road without risk of being hit by passing vehicles while searching for nesting sites. Turtles have a difficult enough time surviving to adulthood as it is. It is a success if even one out of ten young avoids predation in the nest, and then as a small, bite-sized treat for mammals and birds of prey. Adding the risk of being hit by a car after beating the odds to become a productive member of turtle society can take a serious toll on the ultimate success of a local population. If we can eliminate even one hazard to our at-risk species, we can help local reptile and amphibian populations rebound and maintain the impressive biodiversity of the Garden State. Allegra Mitchell is a biologist at the Conserve Wildlife Foundation of New Jersey. She will discuss rare herps at the Environmental Education Center in Basking Ridge on April 7, 2019.